It doesn't get any more rustic than a bench made from logs. 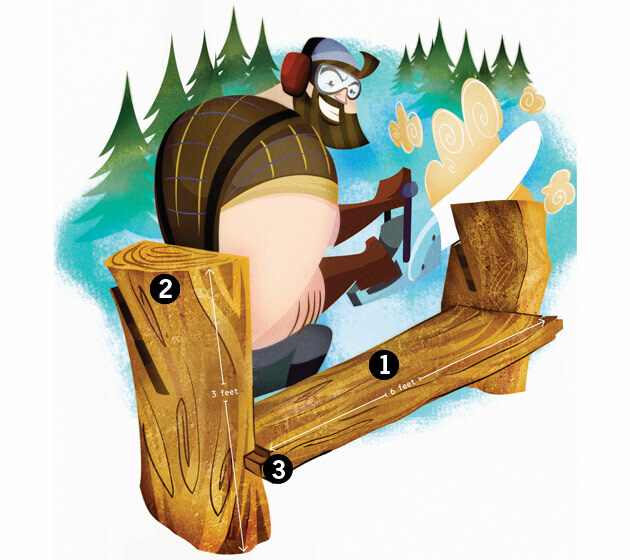 Find out how to build a bench like this with a chainsaw. This is a beautiful and highly functional folding table. Build this free woodworking plan in no time at all when you follow the step by step directions provided by the Canadian Home Workshop. They have every thing you need to build this free woodworking project including detailed description, material list, and full color downloadable illustration. This is a very versatile free woodworking plan. It can be used as a serving platform, bar, or extra seating on your deck or patio. Use the easy to follow plans, material list, and 3D illustrations provided by the Canadian Home Workshop to build this super project. Adirondack Chairs are one of the most popular free woodworking plans on the Internet. We are trying to bring as many of these chairs and free plans as possible. This one is a good plan from Black and Decker. It seems easy to build and all of the information including diagrams and a materials list is on the website.